Nice going, kids. 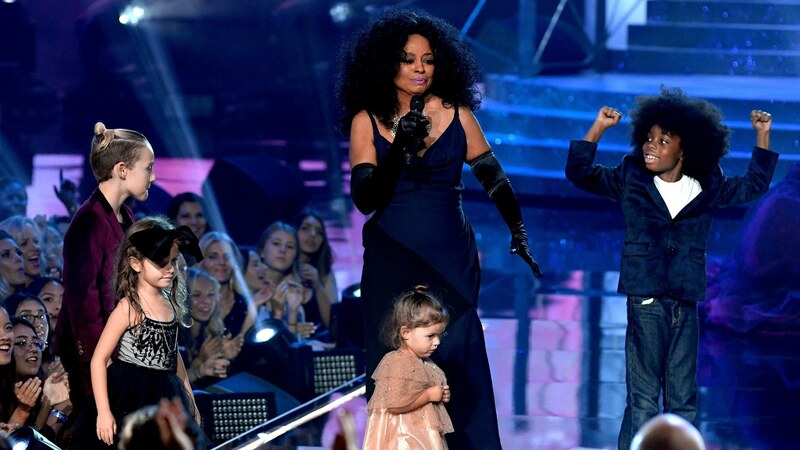 But Twitter really only had eyes for Ross’ grandkids, who boogied down onstage in celebration with Grandma. Diana’s victory lap started as a solo performance of “Ain’t No Mountain High Enough” and ended in a grand-diva-plus-grandchildren dance party on live TV. Not too shabby, Ross clan. Check out the clips (and tweets) below. The grandkids started off wiggling in the audience. Jagger, daughter of Evan Ross and Ashlee Simpson — who knew? I DID NOT KNOW — was shy and stayed in her dad’s arms. But her older bro, Bronx, and her cousin Ryan started shimmying pretty hard. And when Grandma Ross beckoned for her grandchildren to come up on stage, they needed no further persuasion. Twitter is prepared to adopt all of them, especially Ryan, whose mad moves enchanted millions. The kiddos even pulled a (nice) Kanye. Ross, accepting her award, said, “This is all about love,” and grandson Ryan immediately Kanye’d the mic to say, “Grandma, I love you and I’m so proud of you.” I mean, come on. Killing it clearly runs in the family.